After a massive expansion, Haggen is shrinking again. The Bellingham-based grocery chain announced it will close or sell 27 of the 146 stores it recently acquired from Safeway and Albertsons. Only one of the stores slated for closure — Haggen’s Spanaway location — is in Washington. Haggen took over Albertsons stores in Silverdale and East Bremerton, and a Safeway store in Port Orchard this year, entering the Kitsap market for the first time. 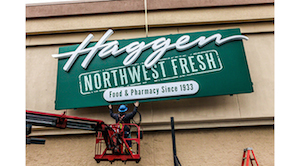 Media reports indicate Haggen’s rapid expansion has run into turbulence. Stores laid off employees in California (LA Times story) and cut hours in the Puget Sound region (Seattle Times story). What’s been your experience with Haggen stores in Kitsap so far?